The artist-run Content Creators Coalition (c3) has launched a mobile billboard tour to counter lobbying efforts by Liberty Media CEO Greg Maffei to tank the bipartisan Music Modernization Act (MMA). Liberty Media owns 71% of SiriusXM, which continues to make record profits while refusing to pay elderly artists when the service uses their music. While Mr. Maffei is in town lobbying Senators this week, the billboard will be at several locations around the Capitol. 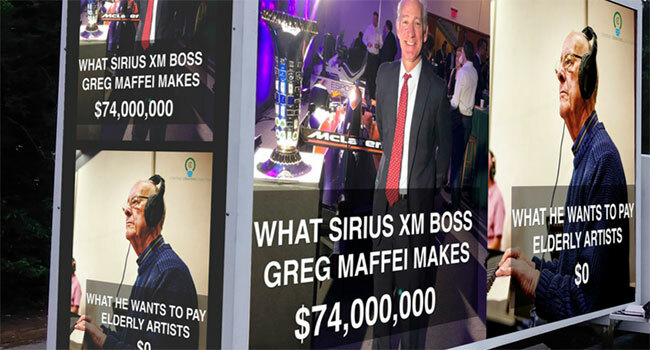 “The fact that Mr. Maffei and SiriusXM continue to directly profit off the work of elderly artists without paying them fairly is appalling. And the fact that SiriusXM thinks storming the Hill with a Wall Street CEO and an army of lobbyists in a desperate, last-ditch attempt to kill the Music Modernization Act, shows the world just how clueless the company is,” says The Content Creators Coalition in a statement. “The bipartisan Music Modernization Act is legislation that rights the wrongs of current law and closes the loopholes that have allowed some radio services to make billions while not paying artists fairly.